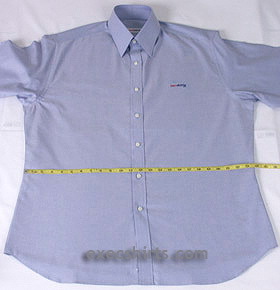 Start counting at the neck, and count down until you reach about between the fifth and sixth buttons on the shirt. Measure the width of the shirt from seam to seam. Take that number and multiply by two, this is your actual waist measurement. 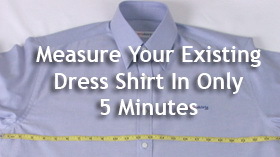 Round up your measurement to the nearest full inch. NOTE: We use a "tailor's measurement" to get your Sleeve Length, this is your actual length. 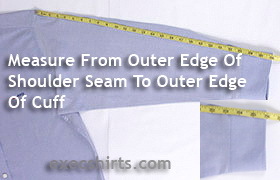 When you buy an "Off The Rack" shirt in the store your Sleeve Length will be longer because they use a "retail measurement" that includes both your Sleeve Length and half of your Shoulder Length. Do not be alarmed if the Sleeve Length that you give us is 10-12" shorter than your normal (retail) Sleeve Length; it is correct. Measure from the middle of the button hole to the middle of the button. If the neck is perfect, use the actual measurement; If a little snug, add 1/4 inch. Round up your measurement to the nearest quarter inch.